Working out at home? 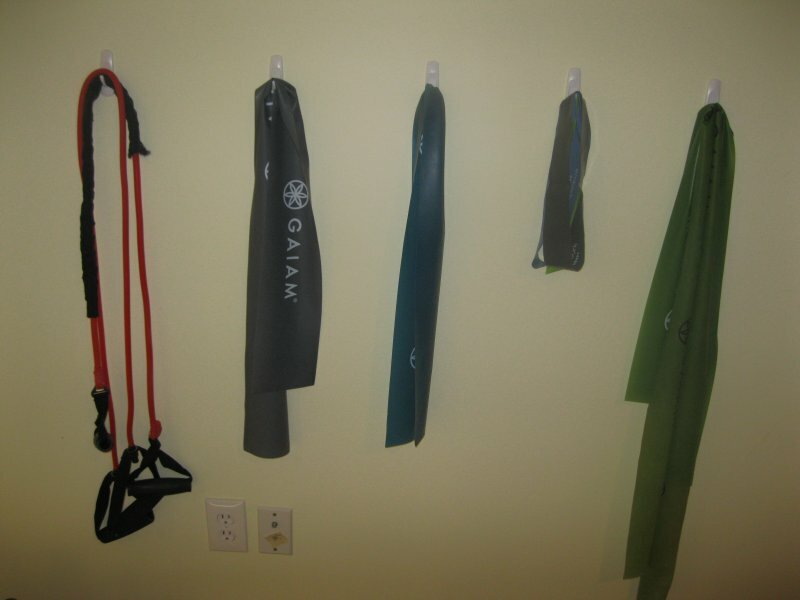 Your home gym must-haves! Think you can’t have a home gym? Think again! The idea of a “home gym” may seem unattainable to some, but it doesn’t have to cost a lot of money or require a lot of space to get in a good workout. I love having the freedom of working out at home. No one else is hogging the weights, you don’t have to sign up for a class, childcare is free, and you can do those crazy exercises you wouldn’t dare do in front a stranger! Since money and space is an issue for most everyone, I have put together a list of the items I believe are necessary for a good workout space. 1. Free Weights – The most basic items to start your gym with are free weights. It is best to have at least 2-3 sets if you can – light, medium and heavy. The trick here is not to go too light – I don’t recommend buying a set under 5 lbs. for us ladies. If you can get 3 sets, I recommend a set of 5, 8 and 10 lbs. Weights can get pricey, so I like to buy them at a used sports equipment store. You will pay more for those pretty neoprene weights too, so invest in the standard “metal-looking” kind to save $$. 2. Mat – A yoga mat is nice to have even if you have carpet. Aside from the fact that it provides a barrier from your floor, the mat helps your feet get traction when doing your exercises, especially when working your abs. You can purchase these for as little at $ dollars at Walmart and Target. Ok, honestly your home gym does not need anything more than that! You can get an excellent workout with those 2 items. If you have room and money to purchase more, here are some great additions to keep your workouts fresh and interesting. 3. 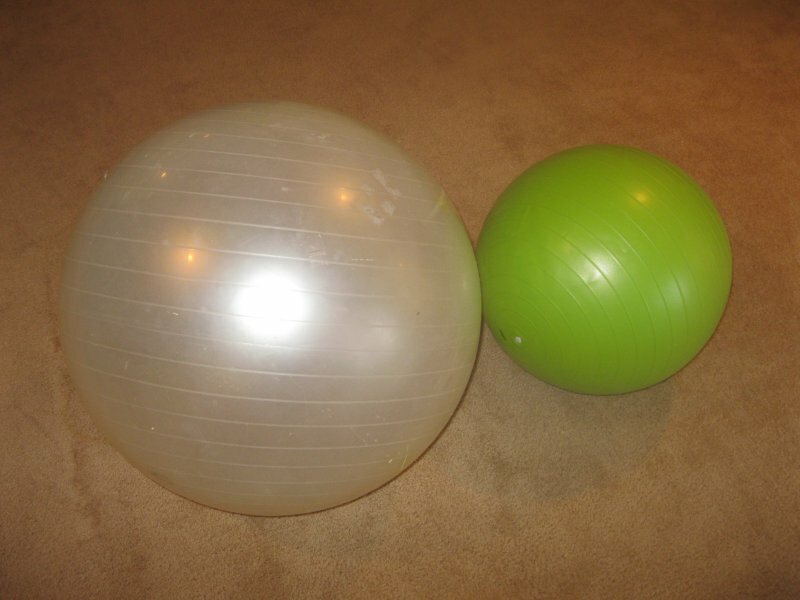 Stability ball– These are so versatile and can be used to work the whole body – $15-20 typically. The key here is to buy the right size for your height, so make sure to check the chart on the side of the box . 4. Kettelebells – Talk about versatile! These are an awesome addition b/c they truly provide a great resistance workout with cardio. 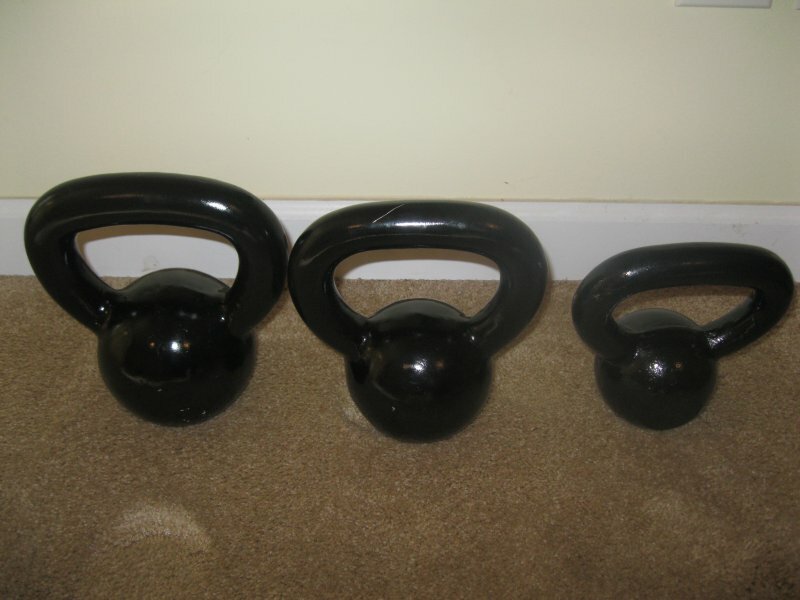 Those kettlebell swings really increase your heart rate! I will warn you that these are not cheap! Again go to your used sports equipment store for the best deal. 5. Resistance bands – I have sung the praises of resistance bands before on my site b/c they are easy to store, provide a great strength training workout, and are fairly inexpensive. You can get a pack with 3 different resistance levels for $12-$15. 6. 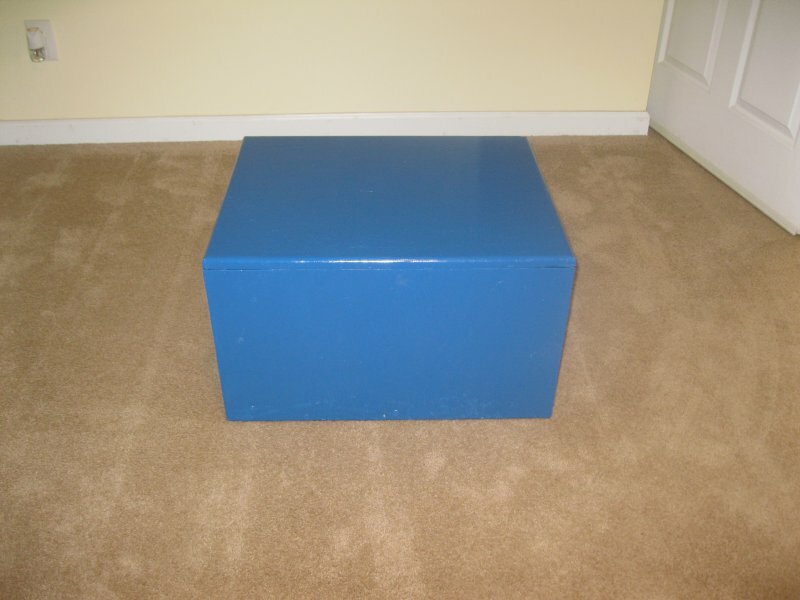 Box step – A plyometric box or a sturdy stepping space is very versatile and adds dimension to your workouts. You can add box jumps, crossovers, tricep dips, push-up alternatives, and just running up and down on the box gives a fabulous cardio option. The possibilities are endless with a sturdy box. Make sure it is a sturdy box made for exercises of this type. I am fortunate to have a handy husband who has made me my plyo boxes. There are you tube videos and plans on the internet to help you make a box, or you could purchase them pre-made. Here’s mine! 7. 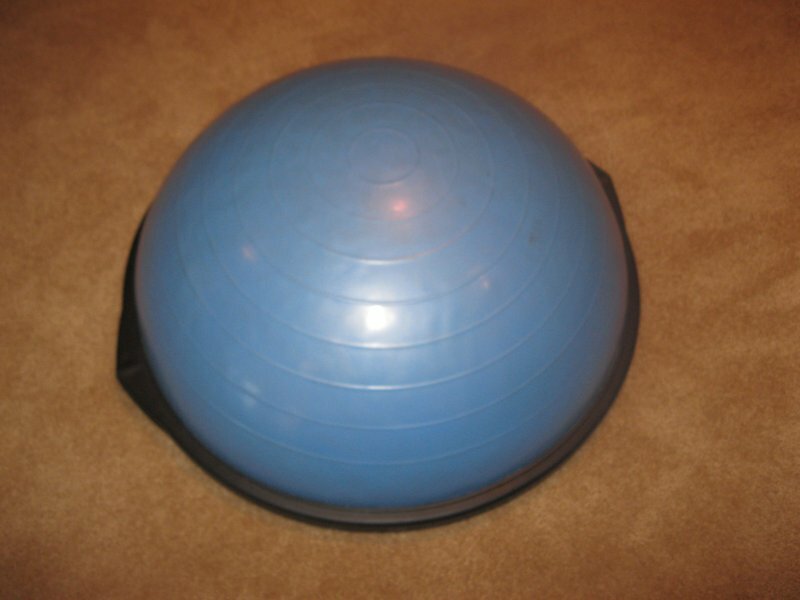 Bosu – I consider this a “real treat” if you can add this to your exercise space. These run around $100 new, so again go used if you can. I love the Bosu b/c you can get a full workout on it, plus it’s unstable surface engages your abs and stabilizer muscles that don’t get used very often. 8. Jump rope – Excellent cardio option and a great way to take your workouts outside! Get a good quality jump rope though, b/c the chap ones “wrinkle” too easily and make jumping difficult. While all of these pieces of equipment are very helpful and break up the routine never underestimate the value of using your own body weight as resistance. With the right moves you can get an incredible workout with no equipment necessary – so no excuses! Home Gym machines are great to Save Time and Money, and Time is Money, so the benefits are more for those who value their Time! And as you say, we can build our own Home Gym according to our goals, needs or possibilities. We can invest more money getting a complete Home Gym machine, a Treadmill or a Vibration machine, or get only few and not expensive tools like a pull-up bar, a pair of dumbbells and a Swiss ball. There’s a wide range of possibilities!! « Reap the IMMEDIATE benefits of exercise!